The launch of the IAB’s Online Performance Marketing report this month provides a wealth of validation and intelligence about the strength and success of the online lead generation space. For an overview of the report, and some excellent analysis of the affiliate marketing data it provides, see the recent posts from Simon Holland and Chris Johnson. The Magnetise Group has been an active supporter of the IAB’s work for a number of years now. We’re on the IAB’s Lead Generation Council, and both supported and submitted data for the report, which warrants a closer look. You will already no doubt be aware of the IAB’s core Adspend study that has been running since 1997. As the IAB themselves have stated, although this report is both solid and well-researched, it has not yet been able to adequately quantify spend in lead generation due to the vagaries of how people define the discipline, and report on the relative spend. At the launch event itself, it was encouraging to see how little surprise there was at the figures presented. The fact that lead generation spend alone was calculated to equate to around £114 million in 2012 was met with all-round approval, and much more realistic than the figures from the Adspend’s H1 2012 report which suggested just £45 million was spent across lead generation, search affiliate, solus email, mobile SMS / MMS and audio. The volume and average price of leads recorded by the study also sits in tandem with our own internal figures which suggests that the valuation is more or less on the money. This suggests for the first time I have seen that CPL is the next ‘sweet spot’ pricing metric due to its ability to drive both volume and value. CPC’s popularity will start to be challenged by CPL for its ability to better balance the risk and reward for publishers and advertisers. CPL is also enjoying the benefits of new formats, increased reach and fast evolving technology that is making lead generation more applicable, assuring publishers of its relevance and making it more attractive to budget holders. Anyone unsure of the potential of CPL should take a look at the likes of Google’s increasing activity in the space. Its search-based lead generation campaigns, in areas such as mortgage comparisons for example, may frustrate some lead generation companies but the fact that technology giants are fast adopting CPL as a natural pricing model should be heartening and welcomed. Accenture’s prediction of a Cost Per Desired Outcome (CPDO) is another approach to pricing that we will be hearing more of in the future, whereby pricing metrics are based on the outcome required by the advertiser. This is already quite close to how we structure CPLs today with regard to the type of data the advertiser wishes to collect. 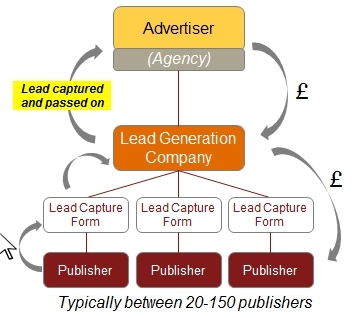 There are actually 2 faces to lead generation, one of which is laid out in the report (above), whereby the platform collects and prices the leads on behalf of the advertiser. The other route to running lead generation activity gives more control and flexibility to the advertiser by enabling them to essentially own both the pricing and lead capture forms as well as have more control over branding and creative. This is again in line with the general trends in digital marketing. As marketers get more au fait with and interested in data, the demand for more granular insights and controls rises in tandem. Lead generation is very customer-focused marketing, unlike CPC where the keyword is arguably the most important aspect, in lead generation it’s all about the prospect data. 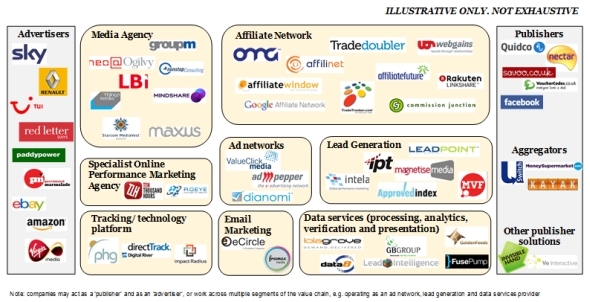 The report also included a depiction of the performance marketing ecosystem which appears to back up this view. Lead generation and data services are clearly separated out, and as you’ll see Magnetise Media (which operates our TopFox white label competition platform and follows the traditional lead gen model depicted above) and Lead Intelligence, our management and analytics platform which follows the second route I’ve described, have been split accordingly. 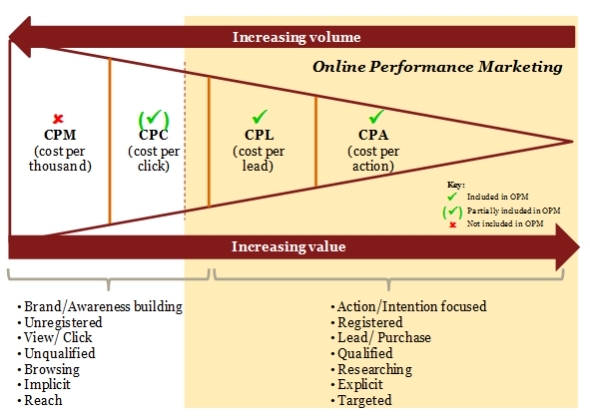 While this ecosystem image is a useful illustration of the different aspects of performance marketing, it will need to become a lot more complex, distilling down into the new mainstream lead generation channels of search, display and social for example, if it is to be truly representative of the burgeoning sector. Looking at the image above, we’d agree that finance is the strongest spender, but our own activity suggests that telecoms and media, as well as travel and leisure, are more active than retail. 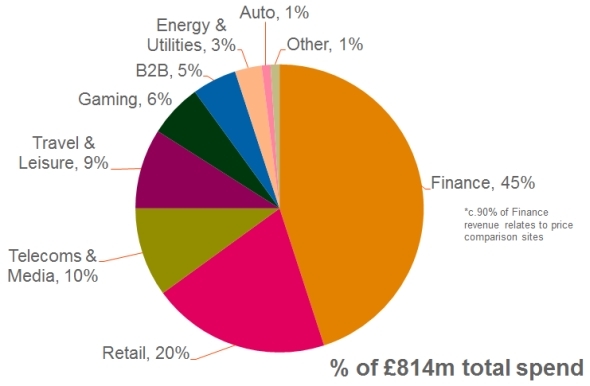 It’s unusual not to see the FMCG sector represented too, although this could perhaps have been merged into retail. Regardless, the budgets and marketing appetite of FMCG are an important one for lead generation to tap into. Marketers in this space require both efficiency and a wealth of insight into performance and pricing which lead generation can already deliver. With TENA Lady for example, its lead generation sampling campaign through display is helping the company closely target and attract exactly the right kind of customer, efficiently and cost effectively. I would suggest that as CPL and CPA pricing starts to unlock mainstream channels further, much as we’ve seen with CPC in display with Criteo, we’ll see many more FMCG brands enter the fray at a significant level. Similarly, energy and utilities will also expand activity, and education should also start to figure in the next report. We’re looking forward to the next research study to be able to at last closely track and trend lead generation activity and growth over time. The ability for marketers to optimise around real data from leads rather than relying on impressions and clicks is going to drive actionable insights that will improve campaigns and deliver ROI on a massive scale. Lead generation technology developers are also constantly innovating in areas such as new channels, premium media integration and also looking at areas such as customer generation, which is a natural next step for us to take. All together, the IAB report and activity in the space is generating a palpable buzz that will only grow stronger and more prevalent as the years goes on. Do let us know in the comments section below of any other key findings you feel warrant further discussion. The lead generation conversation has only just begun!